Wait, aren’t you reviewing Membership Plugins? You’re probably wondering why I’m talking about Zippy Courses today. If you’ve been following along, I’m looking at 31 membership plugins over the course of July. Already the list has gotten pretty big and we haven’t hit some of the big names yet. So you look at all of that and wonder why I’m sharing with you a plugin that is for eLearning or online courses. It’s simple. 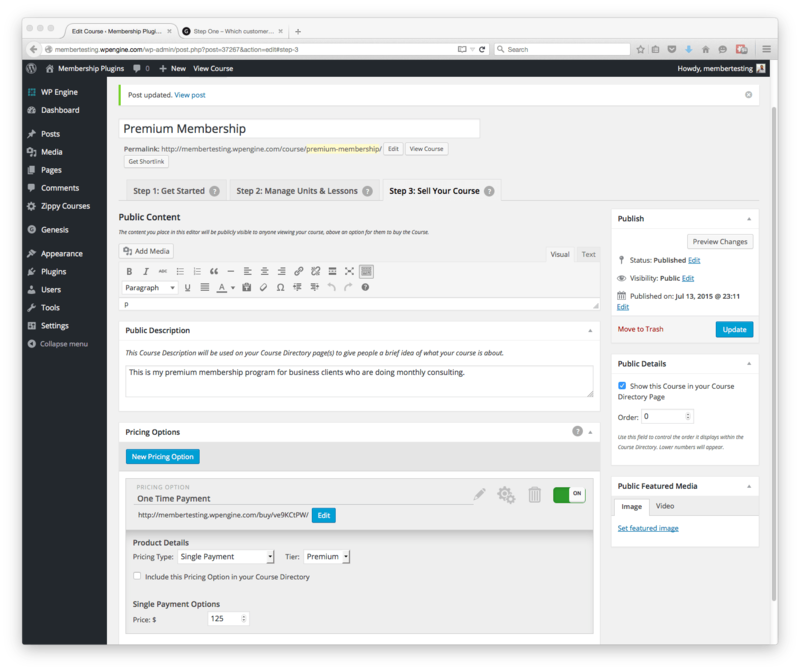 There are a ton of people who use membership plugins for that very purpose. So it makes sense, if you think about it from their perspective, to look at a product like Zippy Courses. Why do people create membership sites? I believe there are five reasons why people create membership sites. I don’t mean what drives their motivations. I’m talking about the goal or purpose of the site. They want online content protection for an off-line relationship. When you buy your car you get access to a dealership site to watch videos on programming those three buttons on your garage door remote on the visor. It’s not special content. But it’s protected because it’s only for people who have purchased a car from that dealership. They want to sell access to private information in the form of a course. Tons of people register for courses and get private (and potentially time-limited) access to material that they’ve paid for. It is normally sequenced information and teaches them something. This can be hair-cutting videos or illustration classes. They want to generate revenue from existing content. There are people who already have a lot of content and would simply like to monetize it. So they put it behind a paywall, schedule it to drip, and set it to forget it. The web is filled with stuff like this, I don’t need to give you an example. They want to conduct a one-on-one relationship online. Trainers, coaches and more will often attempt to create a protected site where they can further the one-on-one relationship. The trainer at a gym, for example, may have a personal site that you can log in and view your specific training regimen, along with a place where the two of you can communicate and share information with each other. They use eCommerce & a protected place for community. Sites like Match.com create a subscription and protected place for you to interact within a community. Many subscription sites are using the combination of eCommerce and membership to create a sense of belonging to further a personal objective. When you look at that list, you quickly discover that Zippy Courses does one of those five (#2). But if you look closer, there’s no reason why Zippy Courses can’t also deliver value for numbers one or three. So that’s why I’m looking at Zippy Courses. Let’s dig into the feature set for a second and run thru the checklist to see how Zippy Courses stands up to some of the other plugins I’ve already looked at. But it does it by letting you create a course. I’ve said it before and I’ll say it again, Zippy Courses may have the cleanest UI for course creation in the WordPress space. 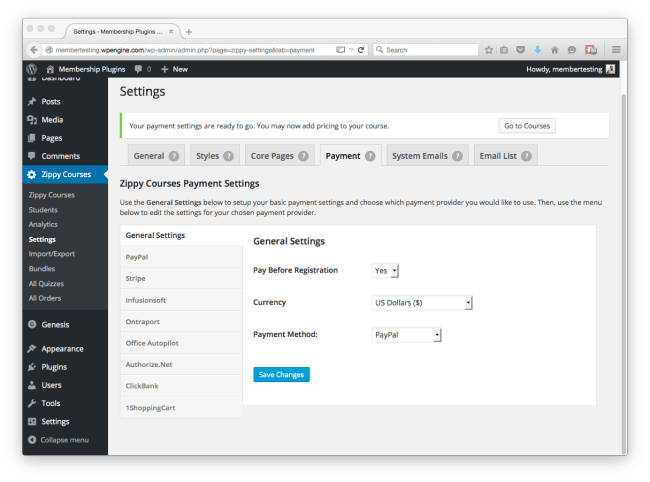 Zippy Courses may have the cleanest UI for course creation in the WordPress space. Not just from one or two gateways either, but from 8 different payment gateways. It integrates with autoresponders. Look at this list of partners. Again, a very full and complete list! While it creates pages for you, you have the option to adjust them and it uses shortcodes effectively. It even protects you from mistakes with those automatically created pages. This means you have all the control you want. And when you want a directory of the available membership levels (or courses), you just drop a shortcode on a page. And it lets users buy and get access to as many memberships / courses (however you’re thinking about it) as they want. Concurrently. 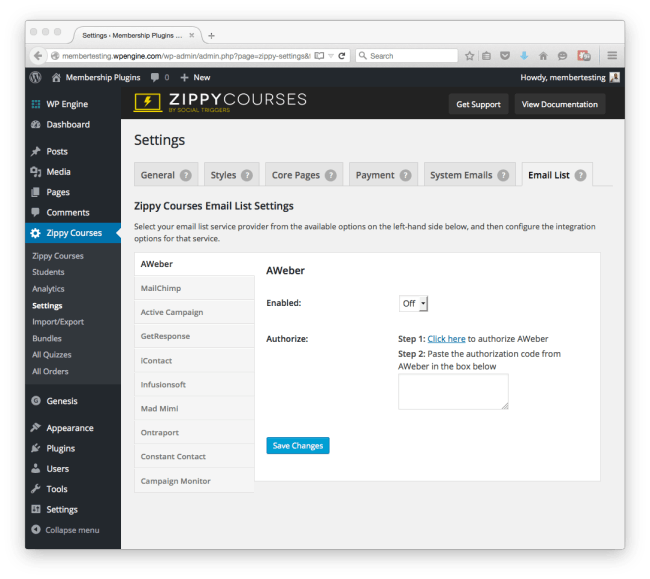 If you’re looking to build an online course, you should check out Zippy Courses. If you’re looking to build a membership site & you’re OK breaking content into lessons, use Zippy Courses. 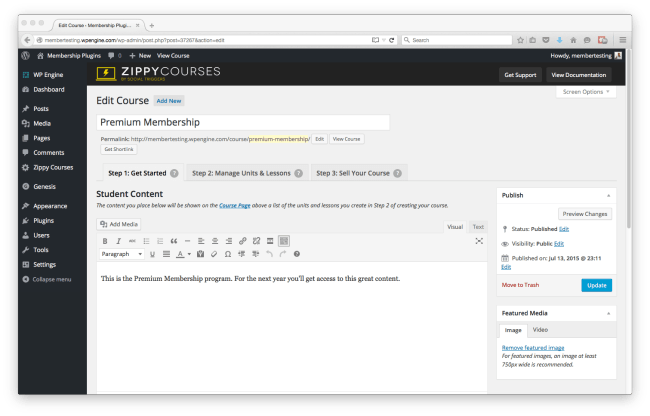 There is one feature that Zippy Courses has that every membership plugin developer should look into. It’s specifically around pricing (which you know I think a lot about). Simply put, Zippy Courses lets you create multiple ways to charge for your product. Notice the payment option at the bottom. It’s a single payment for $125. But we know that some people aren’t ready to pull the trigger on that right away. So look at this other option. It creates a monthly plan. No one else has done this and I keep talking and writing about it. I hope to see it in more membership plugins before the year ends. Scoring Zippy Courses feels a bit wrong given that it’s an LMS plugin competing with other Membership plugins. But it does well enough that the “wrong” feeling went away pretty quickly. While you can create eCommerce support by selling a digital download and having someone register for it, it doesn’t yet support or integrate with a common eCommerce solution.